Explore the numerous day-trip ideas around Perth: Yanchep National Park (in Yanchep), Hillarys (Pinnaroo Point Beach & Sorrento Quay Boardwalk) and Fremantle (Fremantle Prison, The Shipwreck Galleries, & more). Pack the 11th (Mon) with family-friendly diversions at Adventure World Perth Australia. On the 18th (Mon), spend an adventurous day with a kayaking and canoeing tour. 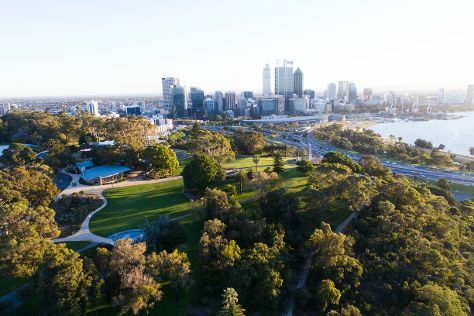 And it doesn't end there: stroll around Kings Park & Botanic Garden, indulge your senses at some of the top wineries in the area, let your taste buds guide you at a local gastronomic tour, and contemplate the long history of The Perth Mint. To find other places to visit, photos, ratings, and more tourist information, refer to the Perth tour builder website . If you are flying in from United Kingdom, the closest major airport is Perth International Airport. Expect a daytime high around 38°C in February, and nighttime lows around 20°C. Finish up your sightseeing early on the 28th (Thu) so you can travel back home.